Forget Park Run, Tough Mutha, Iron Man and triathlons. A few weeks ago we embarked on an endurance feat far more favourable to writers on the research trail: 4 monasteries in 24 hours or, as we fondly christened it, The Tough Monk Challenge. Medieval monasteries and abbeys are an integral part of Scotland's historic landscape and many of them are rightly famous landmarks including Iona, Dunfermline, Sweetheart and Inchcolm. The Scottish monastic movement has its roots in the Celtic period and was a great influence in the way Christianity spread after the seventh century with abbots remaining far more powerful than bishops. The early monasteries themselves, however, bore little relation to what we now understand from the term and were often little more than isolated collections of wooden huts inhabited by hermits. It is not until the Normans begin to really impact on society after 1100 that we see a great wave of Scottish monastic building, promoted particularly by King David I (1124-1153). Life in medieval monasteries was strictly organised and strictly run and, whatever order the monks espoused, the principles were broadly in line with (or reacting to) the rules written by St Benedict in c.530 AD. Not only was the internal life rigidly structured, the external fabric (the buildings) also followed a set of ideals, known as the Plan of St Gall. The plan, named after the Abbey in which it is still held, is the oldest preserved visualisation of a medieval building complex. Five pieces of annotated and sewn together parchment contain the plans for forty structures as well as boundaries and roads and an orchard. 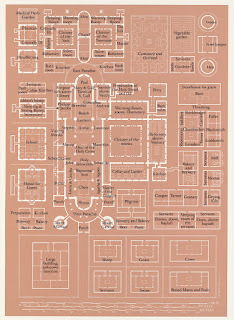 Each building and its use is identified in 333 inscriptions and include bake and brew houses, an abbot's residence and a dormitory and refectory for the monks. It appears to have been designed for Gozbert, the Abbot of St Gall from 816-837, and it is an idealization of a monastery - no complex was ever built to its exact specifications and scholars have described it as a meditation on monasticism. 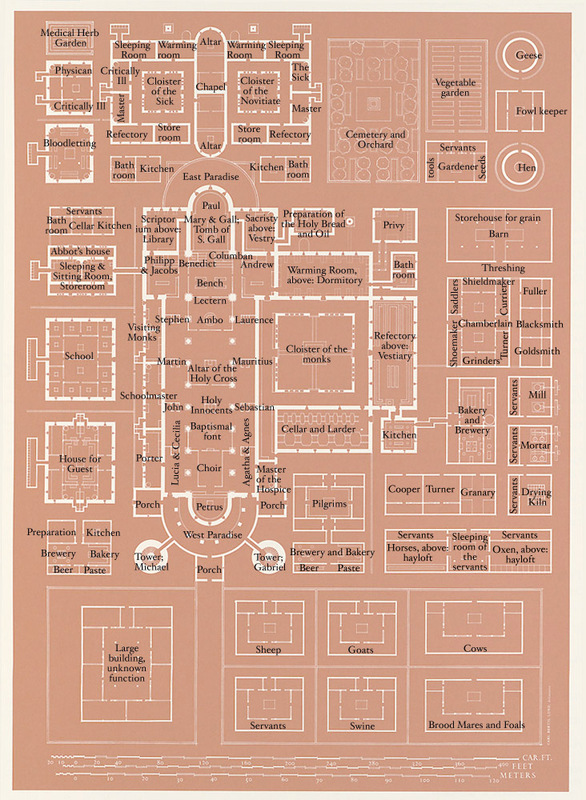 Most of us, however, who are familiar with monastery layouts, would easily find our way round the plan and its influence on the complexes that were built is clear. The four we visited, Melrose, Dryburgh, Jedburgh and Kelso, are all in the Scottish Borders. They were founded between 1113-1150 and all have close links to David I. They are in varying states of preservation, with Kelso being little more now than a massive gateway, but they are all visually stunning - especially if you see them as we did in snowdrop season. With the exception of Kelso, each of the four has its own claim to fame. 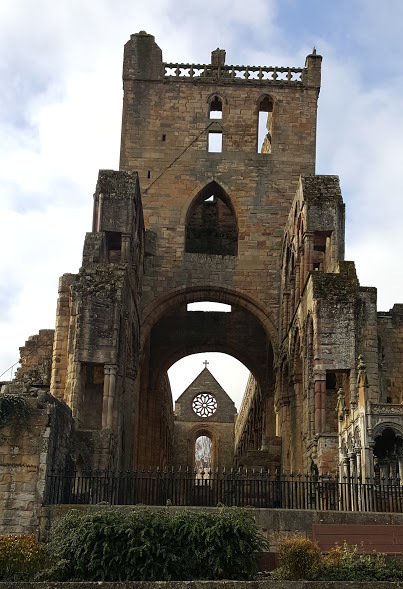 Jedburgh, an Augustinian monastery founded in 1147 is an extraordinary marriage of Romanesque and early Gothic architecture and is the best preserved in terms of its scale and its beautiful rows of arches. Melrose, Cistercian dating from 1136, is most famous for reputedly having the heart of Robert the Bruce buried in its graveyard. That may or may not be true: the Abbey words its claim that the casket, discovered first in 1921 and reburied in 1998, is Bruce very carefully and the position of its discovery, under the Chapter House rather than close to the high altar, makes the idea questionable. It is, however, a nice story and Bruce was known to have had great affection for the Abbey. What I loved most about Melrose, however, are the wonderful carvings which cover the outside and include saints, gargoyles and, for no reason anyone knows, a pig playing the bagpipes. My favourite was Dryburgh. The setting is impossibly romantic, nestled in a bend of the River Tweed and surrounded by trees which act like curtains to the first view. It is hardly surprising that Walter Scott, the great exponent of romantic Scotland, is buried in the ruin's north wing. Accounts of his funeral read not unlike passages from his novels (of which I am a massive fan): the day was dark and lowering and the wind high and when the coffin was taken from the hearse, and again laid on the shoulders of the afflicted serving-men, one deep sob burst from a thousand lips (Lockhart, Life of Walter Scott). I tried not to let the fact that he is buried next to General Haig spoil the moment. 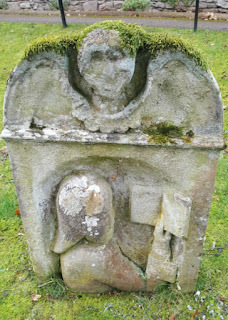 The Abbey also has a Chapter House with traces of medieval wall paintings and a collection of rather wonderful headstones embossed with figures including a number who are reading. Oh and it is haunted by a ghost called Fat Lips - a woman who lost her lover in the 1745 Rebellion, moved into the ruins and maintained that a little booted man named Fat Lips used to do her housework. Could anything be more perfect? 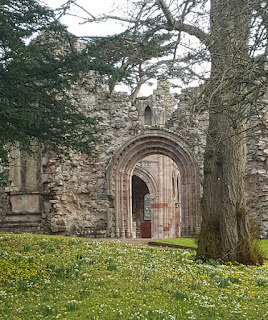 Maintaining a medieval monastery was tough in Scotland even before the Reformation's bite desecrated what was left. If your community was in the Highlands, internecine strife could reduce you to rubble; if you were in the Borders, the ongoing battles with the English were your main concern. Melrose Abbey was destroyed in the early 1300s by Edward II, rebuild and then, in 1385, Richard II burnt it down. The poor monks of Kelso, which was regularly attacked, were reduced to begging food and clothing from the surrounding locals on frequent occasions. It's quite remarkable so much has survived for us to gaze in awe upon. .... is if you don't try. Be brave enough to fail and you will always succeed. Off to the Alderney Literature Festival. Family trees and hidden stories.